If you have been searching for the perfect router table and not sure of the model that can meet all your needs in routing then look no further, Bosch RA1181 is here for you. This is a very useful and an all-around router table designed to help you in some of the most common workshop applications. The Bosch RA1181 is an ideal router table that professionals find to be quite useful in day to day routing tasks. Bosch RA1181 is the best product to purchase if your target is to make an improvement in the precision of the handheld router. This router is designed with a 4-⅞” by 25-⅛ “fence made of aluminum material to enable you to maneuver as well as work comfortably with longer pieces of wood planks. With a maximum opening of about 3-⅝”, you will be able to work well with materials that generate a large amount of sawdust and leave your routing very clean. 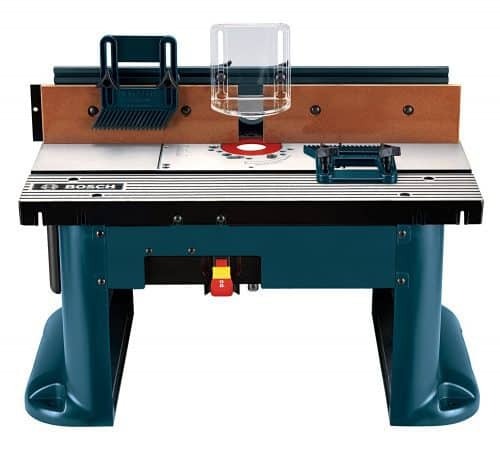 Most significantly, this type of benchtop router is designed with a stable table base to enable you to have top quality and accurate routing. The base is large and provides you with a lot of stability and mounting inserts to let you screw or bolt the router to the ground for even more stability. Normally, this equipment comes with a 2-⅓ inch standard dust port that allows you to make connections with external dust collection without much of a hassle. This is essential in facilitating the intake of air being sucked to help you in keeping the benchtop clean throughout. The miter and the T-slot on the Bosch RA1181 make it easier for you to attach other accessories such as the miter gauge to the router table. In addition, this equipment delivers this unit along with a pair of the featherboards to guide you on getting accurate results when routing. In order to prevent any unauthorized individual from using your router table, there is a key lock that restricts movement of the fence and the base plate. Also, the featherboard that comes as a pair helps you in holding down the material when working on the router table. Furthermore, the router is equipped with a dual outlet so you can easily have more options for connecting the router table to the power outlet. On top of that, there is a 15-ampere overload circuit to protect your equipment in case of a power surge. And the adjustable clear guard acts as a safety gadget to ensure that you route with your visibility secured. The tall fence is made of aluminum material together with the adjustable MDF face plates to give support when working on taller pieces of wood planks. The aluminum material is also used for durability and maneuverability. Also made of aluminum, the rigid router mounting plate is strategically placed to stay flat as well as precise for accuracy. It is also predrilled to give you more options for a variety of routers. It is large (about 27 inches by 18 inches) with the purpose of job-site durability. The easy to use featherboards come as a pair and they are attached to the fence and the table to give an additional guidance as well as kickback protection when working on the router table. It is designed for the standard 2-� inch vacuum hoses to take away all the dirt from the benchtop router table. It is meant for the heavy duty work on the router table and also, it comes with a lock for safety reasons. Even though there are other competitor brands of Bosch benchtop router tables, the Bosch RA1181 remains the most popular among them. This is attributed to the superior quality and efficiency the equipment has displayed in the course of its use. Obviously, your routing experience will not be the same with this model of benchtop router table.